Is there a standard length/width sizing for chasubles and stoles, or are there variations due to the priest's height? Also, is there a difference in the standard length of an overlay stole versus an interior stole? Thanks very much for any answers you can give me? The overlay stole is longer. You want an overway stole to be a total of 96 inches, or 48 inches hanging on each side. The regular stole is 90 inches or 45 inches hanging on each side. 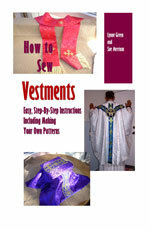 As for the chasuble, our pattern is designed for a man who is 5'10" tall. If your priest is taller, you might want to adjust your pattern accordingly (or if he is shorter, cut the pattern off accordingly). Hope this helps and thanks for contacting us.